Designed from the ground up to be a road-ready, stage-worthy momentary XLR switcher. 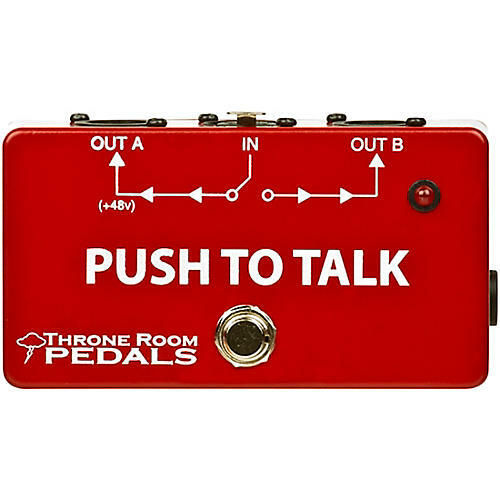 The Push To Talk Box™ is an XLR A/B switcher that allows for a vocal microphone to be used on a main channel and talk back channel. Its most common use is in a live or studio setting. A vocal mic is plugged into the input, and two separate outputs are sent to the FOH or monitor sound board. The default channel goes to the live mix just like using a microphone on its own. The secondary channel is activated with the foot switch, allowing for different effects or to talk through a headset to your sound tech, or to your band through in ear monitors. When the secondary channel is active, the primary channel is completely muted with no bleed from the talk back channel. When the primary channel is active, the secondary channel remains muted. Features quiet switching for both dynamic microphones AND +48V phantom powered condenser microphones.